Underground, power is everything. Light, heat, water, even air – the elements of life all depend on electricity. For the colony buried far beneath a remote patch of Scotland, an endless supply is essential. So when the power runs out, the race is on to find more…fast! Faslane’s fledgling community of survivors has made fantastic progress in its quest to create an autonomous settlement. Now the inhabitants of the former navy base must confront a new challenge as power shortages threaten to derail their bid to keep mankind alive. Elis Howe has an idea, but it means going outside — further into the toxic exterior than they’ve ever been before. Two teams set off on a co-ordinated expedition. But do they have what it takes to confront the perilous conditions and a poisonous ash that has not yet given up all its secrets? 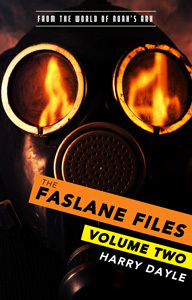 The Faslane Files: Volume Two continues the exciting new series set in the world of Noah’s Ark. It can be read stand-alone, but is best enjoyed after reading the first two books in the Noah’s Ark series (Survivors, and Contagion).